Product #21159 | SKU 738954 | 0.0 (no ratings yet) Thanks for your rating! 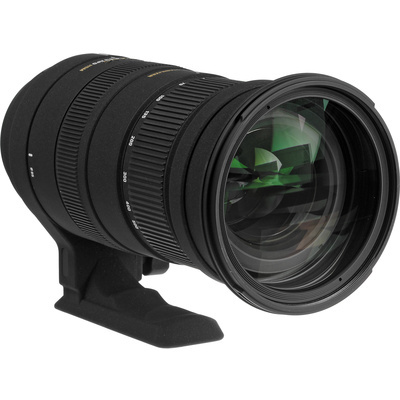 This 50-500mm f/4.5-6.3 APO DG OS HSM Lens for Canon EOS from Sigma is a zoom lens for digital SLR cameras with a Canon EF or EF-S lens mount. The lens has a standard to ultra telephoto zoom range that is ideal for nature, wildlife, or sports photography. The range translates into an equivalent 75-750mm when used with digital SLR cameras with an APS size chip. The lens is also compatible with full frame cameras. You can even increase your telephoto range by using the Sigma APO teleconverters. The OS (Optical Stabiliser) system minimises image blur caused by camera shake, and offers the equivalent of shooting at a shutter speed 3-4 stops faster. This allows handheld telephoto zoom shooting even in poorly lit conditions. The use of the OS (Optical Stabiliser) system, HSM (Hyper Sonic Motor), APO apochromatic design, four elements of SLD (Special Low Dispersion) glass, and multicoated optics all enable this lens to provide a high level of performance throughout its entire zoom range. A rear focus system insures quick, convenient manual focus and a non-rotating front barrel. The improved DG lens design corrects for various aberrations. This lens is specially coated to get the best colour balance, while cutting down on ghosting caused by reflections from the digital image sensor. The lens provides the utmost correction against lateral chromatic aberration, which is a serious problem for digital SLR cameras. Standard to ultra telephoto zoom range makes this the perfect to carry when you only have room for one lens. The OS system uses two sensors inside the lens to detect vertical and horizontal movement of the camera. It works by moving an optical image stabilising lens group, to effectively compensate for camera shake. It automatically detects movement of the camera and compensates for camera shake when shooting a moving subject such as motor sports. The HSM (Hyper Sonic Motor) system ensures quiet and high-speed auto focusing with full time manual focus override. Four Special Low Dispersion (SLD) elements provide excellent correction for chromatic aberration. The improved DG lens design corrects for various aberrations.